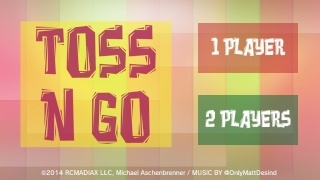 Developed by RCMADIAX as a part of the developer's tabletop line of games exclusively for the Wii U. Toss 'N Go is a dice game that can be played alone or together with a friend and believe us when we say that you'll want to play with a friend. The rules are simple each + dice is worth one point while ● dice are worth a big fat goose egg, however you can roll them again. If all of your dice that remain land on X symbols you'll lose your turn. Get all 10 + symbols and you can roll all of your dice to attempt to score another 10 points! Be the first to reach 100 points to win! However the cpu A.I. is brutal in this game and will often score 50-100 points in one go effectively shutting out the human player. This is a very annoying aspect that's unavoidable for solo players and really hurts this game's overall score. The controls in this game are simple and intuitive and the Off-TV Play works well for a game such as Toss 'N Go! The graphics are very simple, but work well with this game. The music and sound effects on the other hand are a bit pitchy and can be somewhat annoying at times. 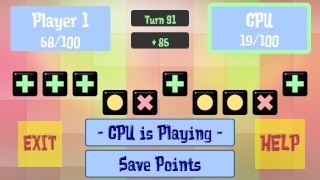 While the premise of the game is simple and fun, the execution of the cpu A.I. is dreadful and makes all single player outings extremely frustrating. The music is also pitchy and can be annoying at times. Simply put while this game can be quite fun with two human players there's just too many issues with Toss 'N Go for us to recommend downloading it. So this game is broken? Not surprised as the developer's only two good games have been from the Blok Drop series. Just fixed a really embarrassing typo...sorry guys! @RoboYoshi wrote: So this game is broken? Sadly if it weren't for that CPU A.I. being broken this game would have gotten a 6/10, but as it stands right now the single-player experience is fundamentally broken. I didn't download this game, but I did enjoy Blok Drop U. This developer seems to have trouble with making non-puzzle games. I am looking forward to Pentapuzzle. @Ragnarok wrote: I didn't download this game, but I did enjoy Blok Drop U. This developer seems to have trouble with making non-puzzle games. I am looking forward to Pentapuzzle. When is Pentapuzzle supposed to release? A 2/10? There are only three games that have been reviewed on this website that have a score this low or lower lol! I'm not surprised, but at the same time I am lol.